Disability is not inability - that’s what most people fail to understand in our communities, especially here in Kenya. That's the message from Lily Oyare, director of Little Rock Inclusive Early Childhood Centre, who helps children from informal settlements. 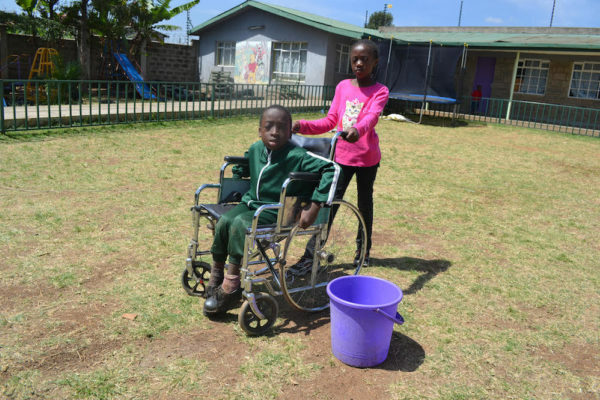 The Kenyan government is not playing a major role, since it only puts aside $20 for each child with disability - yet that is not enough even to buy a wheelchair, which costs $200. The head teachers of primary schools have closed doors to disabled kids because they know having a disabled child is expensive. These children need therapy, which is $25 per session. Our government needs to come and champion children with disabilities because they have something to offer. The government should construct toilets that are disability-friendly and ramps for the children using wheelchairs to move with ease. The teachers in public schools should be trained on special education in order to embrace and teach them, so that children with disabilities can fit into their classrooms. The government should be able to come out and help all different categories of children. In 2003 Madam Lily was volunteering for an informal school. At around that time the government had started the free education system in Kenya. Lily, a mother of four, was moved by how little was done for kids with disabilities in Kibera, one of the largest slums in Africa. She decided to start a school. The first day they had 12 kids and by the second day she had 20 students. She started in a humble background where there was no enough space and the environment was not child-friendly. She was challenged to move to bigger premises. Her dreams, together with the few teachers, were still not achieved. She made sure she went back to college to learn sign language because the first child she encountered in Little Rock had a hearing impairment and she was not able to communicate. She made it mandatory for all her workers to learn sign language in order to communicate with such kids. By Default admin account on 14-Feb-17 08:26.